Shipping Charges for Flexmeters Outside U.S.
obviously well informed info on the net, keep writing! Thanks again and happy boarding!! New articles about snowboard boot fitting here! Another article – Snowboard Boot is Too Big – What can I do? And our comprehensive article about snowboard boot fitting by author Kevin Ryan. The Illustrated Guide to Snowboarding. We recommend snowboard insoles to help perfect the fit and comfort of your snowboard boots. The Eliminator Custom Tongue – fills the Gap between your shin and your boot for better comfort and control. Did you know that 25% or more of snowboard injuries occur to the wrist? And that wearing snowboard wrist guards is a proven way to reduce snowboard wrist injury? Here is an online brochure written by some of the top hand, wrist and elbow physicians in the country. The brochure features safety and injury prevention strategies by orthopedic surgeons at Midwest Orthopaedics at Rush (MOR), who see a record number of winter sports wrist and hand injuries this time of year. Drs. Mark Cohen, John Fernandez, and Robert Wysocki, upper extremity physicians at MOR, are hoping this brochure will help keep winter outdoors enthusiasts safe while on the slopes and rinks. The pointers found in the brochure include information on how to get the proper gear, how to stay in control and how to be cautious of your surroundings. To find the brochure log on to www.rushortho.com and look for the link. Or go to the PDF here. And to order snowboard wrist protection designed by a doctor: snowboard wrist guards and snowboard gloves with wrist guards built-in, go to Flexmeters.com. 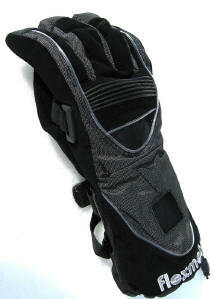 See the video “Are Flexmeter Gloves Warm?” here. Snowboard Boot made my Foot Numb – Help! This question was sent in by a reader. Just bought a pair of Burton Imperial snowboard boots by mail order. I ignored the warning signs of my foot falling asleep the couple of times I wore them at home and went out to the resort all day, mostly hiking, standing around and sitting/kneeling in the snow, as I intended to dedicate the day to giving my girlfriend first-timer lessons. I only strapped into my new board to give a few quick turning demonstrations and then back to sitting around.NOW, it’s the next afternoon at home and my left foot is STILL completely numb and tingling from my toes to the beginning of my heel on the bottom of my foot. Besides seeing a doctor, I still need boots to ride in the future. Do you think the boots could be defective somehow? There seems to be something pressing the side area of my foot, just in front of my ankle. I was thinking of returning them for the exact same model and size to see if I just happened to get a bad pair. My feet don’t seem drastically different in size and my other foot is fine. Would a boot fitter (whatever that is) be able to physically alter the insides of the boot to fit without damaging my foot any further? The boot does seem to be the right size lengthwise. My big toe just touches the end of the liner. Most likely it’s not the boot but the interface between your foot and the boot. I’ll wager that you’d have the same problem no matter how many pairs of the same boot you try. The interior cavity of a snowboard boot (or any footwear) needs to match the shape of your foot. Unfortunately, buying boots by mail order often yields a poor fit and can lead to foot pain like you are experiencing. Boards, clothing and accessories are all OK to order by mail but never boots. Go to a shop that specializes in bootfitting (which is an art and science). Our company, Masterfit Enterprises, runs a school for bootfitters called Masterfit University. We teach technicians from snowboard and ski shops how to match feet with the right boots and to make modifications when necessary. It sounds to me like you are suffering from a nerve impingement. If you have not ridden in the boots I would return them for a refund and visit a shop where they can measure your feet, analyze their shape (there’s more than length to consider when sizing and selecting a boot) and pick a boot that’s a good match. As well as make any modifications to customize it to your foot. Also, consider adding an aftermarket insole which helps stabilize your foot, provides support and enhances balance. It’s the foundation of a good fitting boot. Many shops make custom insoles that are molded to your foot. Our company makes such a product called Instaprint but we also sell a less expensive entry model designed specifically for snowboarding called EZ·Fit that is available in many shops and also on-line. If you really want to get snowboard boots that fit and perform well and let you ride pain free, in the San Francisco Bay Area I suggest you visit Helm of Sun Valley in the South Bay Lombardi’s in the North Bay. The Any Mountain stores are also a good choice and you can find both Instaprint and EZ Fit insoles there. Good luck! We recommend snowboard insoles and straps to help perfect the fit and comfort of your snowboard boots. Snowboarders who want a super-secure link around the shin often add a Booster Strap. The Booster is an elasticized power strap that helps cinch the boot liner and outer closely to the shin which improves power transmission and precision when moving toe and heel side.